Jody Swirepik has a background in environmental management and regulatory experience. Before joining the Clean Energy Regulator in early 2015, she previously worked at the Murray-Darling Basin Commission, receiving a Public Service Medal for her work on The Living Murray programme. 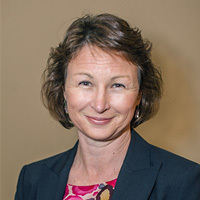 Ms Swirepik transferred to the Murray-Darling Basin Authority in late 2008, when it took over the functions of the Murray-Darling Basin Commission. Ms Swirepik also worked for a decade with the New South Wales Environment Protection Authority and before that in various roles with the ACT government including their Environmental Protection Authority. Ms Swirepik holds qualifications at a masters level in applied science, focusing on natural resource management. Ms Swirepik is the Executive General Manager of the Regulatory Obligation and Coordination division, which provides the Clean Energy Regulator’s scheme obligation and compliance functions under all schemes administered by the Regulator. Key functions include administering of the Emission Reduction Fund including auctions, input into policy design and implementation and compliance and assessment of liable entities under the Renewable Energy Target.